...alas, no deal, no summit, no soup for you! "Poor bugger," Christine Lagarde thinks to herself. Ha - my personal favorite was the one below - there is about 10 big numbers of a EUR/USD bid offer embedded in this one.. So the plot thickens - my best guess is the ECB will fudge and find a way to keep supporting via ELA till the Greek parliament approves the new measures. One of these days Merkel will just ask the US treasury to take a hike - "this is what you guys get for making me cry in 2011"
this is the start of a new world war just being fought economically - greeks will now cede sovereignty to germany by approving these new conditions because they don't have a choice - slowly the other stragglers will do the same through multiple crisis or just worsening economies, and finally France, the big prize will fall. Somewhere hitler is smiling in his grave. An inefficiency like that usually ceases to exist once someone has enough instances to notice it. Yep - "I love it. Rallying into the weekend for the third weekend in a row in expectation of a deal. 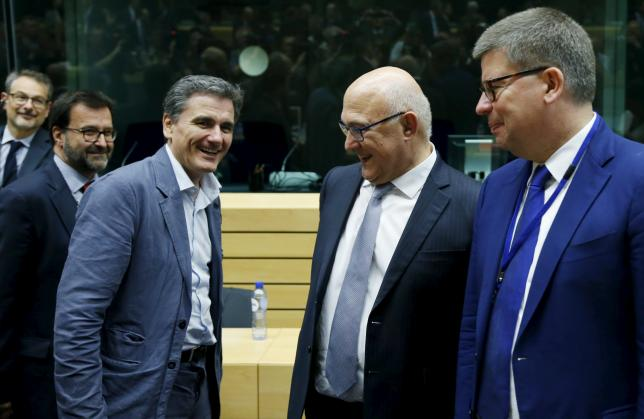 No way the Eurogroup or Germany are going to come back with a no or simply a counter proposal that the Greeks just can't take and back to stand off or worse again. The Greeks look fit, fat are the others in the top photo. Is it the Mediterranean diet..or the leisurely lifestyle? A nation that's unwilling to part with it's 30 hour work weeks, 14 weeks paid vacation and retirement at 55 is simply never going to be productive enough to become fiscally viable! Christine says: "Merde... this one looks like the usual Greek who prefers the men. I miss Yanis with his motorbike and raffish charm, I always had a thing for Bad Boys"
"... [the Greeks] must simply hand over "valuable Greek assets of €50 billion" to be privatised - flogged off to decrease the debt. Who will do the privatising? Schäuble proposes that these Greek state assets - airports, electricity companies, whatever - should be surrendered to a body called the "Institution for Growth in Luxembourg". And who is in charge of this institution, eh? Jawohl, meine Freunde! It turns out to be a front for the German KfW, the Kreditanstalt fur Wiederaufbau, the state development bank that was set up, ironically, as part of the postwar Marshall plan to rescue the bombed-out German economy. 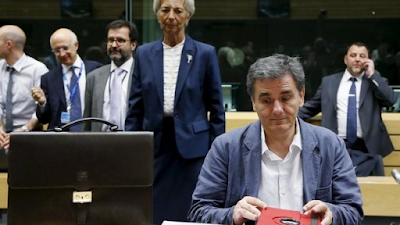 These Greek state assets may be tarnished, they may be indebted, but they belong to the Greek people; and now the 72-year-old Schäuble is seriously proposing that this family silver should be taken and sold by the Germans. Why the Germans? Because it is obvious from Schäuble's proposals that he has complete contempt for the Greeks' ability to run their own affairs." They've had half-a-decade to privatize SOME of that $50B...the same that they committed to at the start--and done NOTHING. And "privatized" or not, it will once and always belong to the Greeks. Wait 'til that Giant Squid class-action comes through and all will be well again.